It is not often we’ll hear a unanimous response in a virtual training poll. Take a moment to read the cartoon (as pictured) and then answer the following question. What is stopping you from taking action on your goals? Choose one of the following, are you? Everyone in the group answered: waiting for something to happen. If your answer is the same, you’re not alone. No matter whether our goals pertain to decisions at work, home, or within a community, we’re stuck. Why? This is a fun and interactive approach to help drill down to specific areas where stumbling blocks occur through a discussion. If the boss says, you can’t, or you can, what’s happening? We’re waiting for permission and hoping someone will come along and give it to us, like in grade school we were trained to ask for permission to do just about anything, including going to the bathroom. Well, you have permission! Another reason for not taking action is that we’re waiting for some inspiration that will motivate us. Let’s explore another vital point. What have we got to risk by moving forward? Do you worry whether the actions will turn out the way you thought or had intended? It is only natural to feel this way. Predicting the future is different from creating it. Sometimes you are not going to know that until you take action. 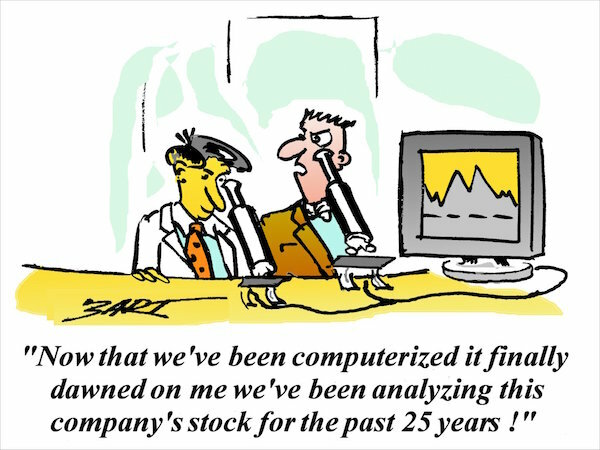 As shown in the cartoon, we get bogged down in overanalyzing a situation, planning too much, and reorganizing our response to what it is we need to do. Sadly, many years may pass us by, until we realize “if only” we had taken action. Don’t let another day go by–review the possibilities of fulfilling your goals now. Ask yourself, what are the questions you still have? You can do this exercise with a friend or partner. For purposes of this exercise, we’ll use an example of going back to school to get an M.B.A. Once you understand how it works, fill in your particular decision, choices, and results to obtain answers. 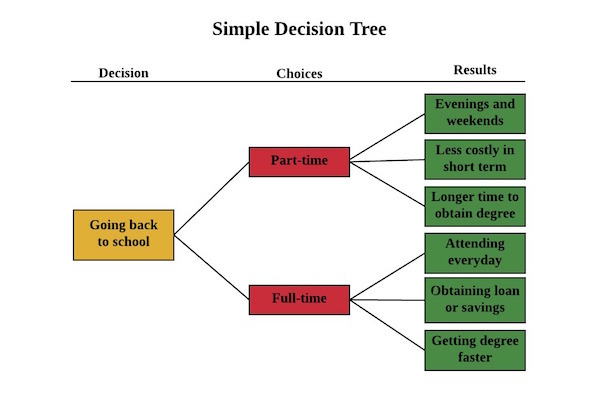 Use the following decision tree analysis to help breakdown your questions and reduce uncertainties. Visualize your goal that rests on making a decision. The goal is to acquire skills to go into management, and you’ve decided to go back to school. List your choices whether you need to go part-time or full-time. List the results or outcomes of part-time versus full-time. For example, determine whether you need to obtain a school loan or to finance your education from savings. Do you need to keep working and is there a graduate school that offers you a weekend or evening program? Make sure you are clear what the questions are and what will be the result of taking positive steps to gain clarity. Most often we don’t ask for help because we perceive what others may think–we don’t know what we’re doing. The opposite is true. Asking for help is the main idea in collaborating with others. An expert or someone more skilled than you can help expedite your research. When someone is offering a skill that you may not have, you can learn from them too. Asking for help is an opportunity to team up with others. Offer skills you have to strike a balance with those you seek from others. Most people prefer that you asked before they volunteer to help. Try it. Ask! As soon as you begin talking with someone else about a decision you are waiting on, your fear will seem less overwhelming. Your fear of taking action will diminish when you have to justify your actions. An adviser will ask what it is you’d like to do and why do you want to achieve it. For example, if you’re wondering whether going back to school for an M.B.A. degree is worth your time and money. Your adviser would review with you the statistics of earnings potential and career choices. Your trusting friend or partner will be supportive and help you see yourself taking on new career challenges. See also Have a Heart Talk and find an exercise time to review and talk through the obstacles and get to a conclusion. My Friday Lunch Webinars are custom designed for your organization or group to deliver, and I will assist you with the tools, techniques, and strategies. Help your team, organization, or community fulfill their goals and be happy. I am available for an initial half-hour consultation for individuals. For groups, I offer a one-hour introductory session for Q & A. To answer your questions and to get in touch, contact Ann at (561) 414-6503 or ann@annmaugustine.com.